Now that our fish finger days are behind us, I almost never make chips (oven or otherwise), but I’ll occasionally rustle up a tray of sweet potato fries. 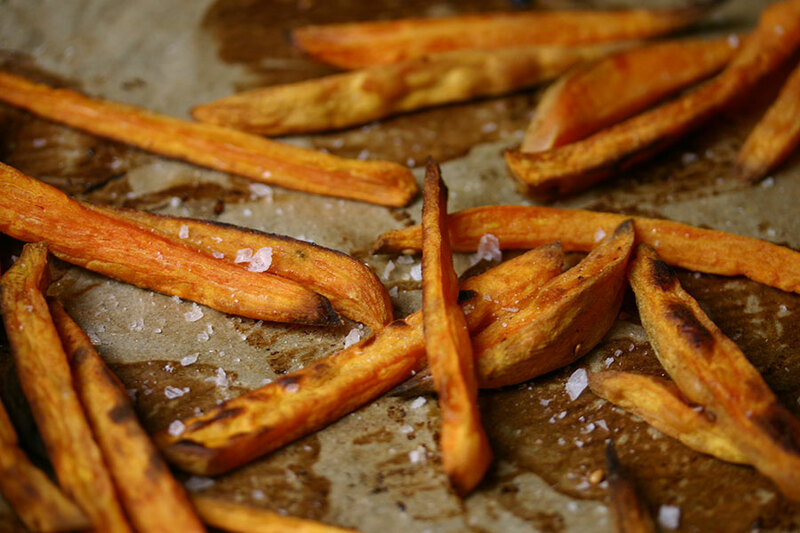 Sweet potato fries cook faster, are healthier, and taste delicious, but they can turn out soggy. Over time, I’ve worked out how to produce sweet potato fries that are satisfyingly crisp. Cut the sweet potatoes into even strips. Soak in a large bowl of cold water for 30-45 minutes. Drain and dry thoroughly with paper towel. Preheat the oven to 425°F (210°C). Line two baking sheets with parchment paper. In a large ziplock bag, shake the fries with the cornstarch to coat. Tip them into a mixing bowl, toss with the olive oil. Sprinkle with paprika or cumin (if using) and toss again. Arrange the fries on the baking sheets, leaving space between them so they can crisp. Bake for 25-30 minutes, flipping once.